This workpackage deals with the different aspects that are important for the design and development of a modular and reconfigurable central station as the core element of the technical infrastructure either on the moon or in the deep sea. Modularity in our context is the system’s capability to allow the swapping and adding of components during its development and build phases, thus permitting a high reusability of components and modules for different missions. Modularity is a major pre-requisite for reconfigurability, a systems ability to change its configuration (i.e. the physical and functional arrangement of the subsystems and/or components) during mission operation thus incorporating different system states repeatedly and reversibly. A system state here is distinct and described by certain attributes of the system with respect to a static environment. The overall development effort has different “layers” (see figure below). 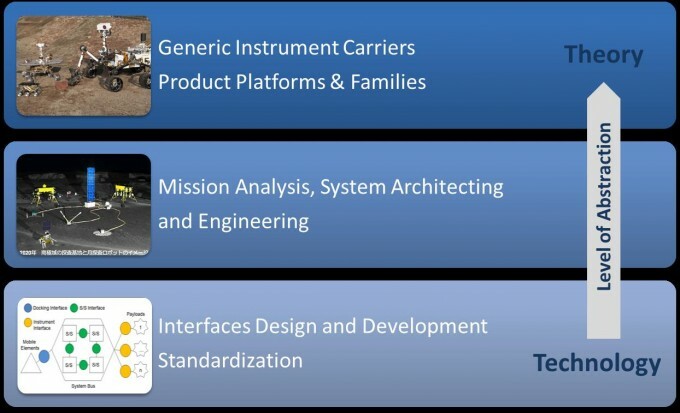 Layer 1 is the most abstract layer, as it is dedicated to the theoretical investigation of novel concepts for exploration systems, such as generic instrument carriers and the development of product families. Here we are going to analyse how we can change the way spacecraft for the moon are built (i.e. as one-of-a-kind systems) e.g. by introducing so-called generic instrument carriers that can be reused for different missions with only changing the payload to be carried along. In the deep sea this approach is already applied with the so called landers. Layer 2 is dedicated to the mission scenario analysis and system architecting activities and the coordination of domain-specific analysis (e.g. structural and thermal analysis) of the system. The analysis of scenarios includes the investigation of the scientific background (in close interaction with Topic 1000), the transport, setup and operation of the required infrastructure and the challenges in the field of logistics, landing site safety and operational reliability of the systems within the difficult lunar and deep sea environment. The central station architecture will be designed and developed to provide all the functionality that is required by a variety of future possible payloads and to realize a multitude of different mission scenarios, ranging from seismology-focused scientific scenarios in the lunar equatorial regions to lunar volatile investigations at the Polar Regions. Layer 3 is dedicated to the technological aspect of system modularization: the design and development of (standardized) interfaces. Technical aspects investigated here are, i.e. bidirectional communication, modular and expandable data management, intelligent power supply and thermal control interfaces. This will lead up to the actual hardware development and testing of interfaces in the lab and in field tests. Regarding interfaces we will also investigate modular (docking) interfaces for different mobile elements of the infrastructure, i.e. underwater platforms or rover systems as well as interfaces to external power sources. One example of such an interface is the inductive charging interface for either rover-to-bus or payload-to-bus connection as described in WP 2300. The WP 2100 development efforts. Images: top NASA/JPL – Three generations of Mars rovers; middle: JAXA/ISAS – Lunar architecture; bottom: Interface types to be studied.